If we are wearing the right shoes, we can climb to the top of Boulder Rock and get a much better view. Looking south, we can see Kaaterskill Clove; looking southeast, we see the southern Hudson Valley; looking east, we see the Taconic Mountains and, finally, looking north, we can see much more of the Hudson, stretching almost to Albany. But it is not today’s scenery that captivates us; it is an image from the distant past. We geologists are like that. 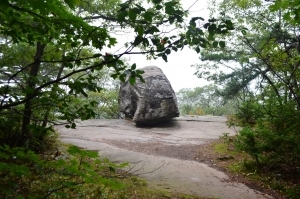 When we are standing atop Boulder Rock we can transport ourselves into the past of some 14,000 years ago. We stand upon the boulder again, but now in a different moment of time, and before us lies the Hudson Valley as it was during the latter stages of the Ice Age. We have arrived here just a few minutes before dawn on a cloudy day. The cloud cover is thin and so a lot of defused sunlight manages to penetrate it. This Ice Age Hudson Valley is cloudy but well lit. above the Boulder Rock ledge. In fact it had overridden all of South Mountain, and North Point too. But, recent centuries have seen it melting away. Still, the valley remains almost filled with ice. The glacier is almost 2,000 feet thick out there, just a short distance to the east. And, stretching beyond that, the ice reaches all the way to the Taconic Mountains on the other side of the valley, a distance of many miles. Those mountains rise above the glacier. They lack much in the way of color. They can, this morning, only muster a darker shade of gray, enough to contrast with the glacier. The ice is also gray, but mostly a lighter tint of that dull “color.” As it has melted away, soot has been brought to the surface to discolor it. The surface of the glacier is irregular; here and there we can see shallow pools of water. These never get very big; they always find a way to drain down into the ice below. The bottom of the glacier cannot be seen, but it is very wet down there. The glacier is broken by great fissures; these originally formed as crevasses, back when the ice was still advancing to the south. The brittle ice could not stand the strain of movement and it gave way and fractured. But that was long ago; now the old cracks have lost their once sharp edges. These have gradually melted away. Warming climates have taken a toll. The glacier has an aged look to it. Time passes and the rising sun has broken through the thin cloud cover and now sunshine radiates across the entire vista. As the sun continues its ascent, the ledge all around basks in its warmth. Even in these cold times the sun can warm things up. Some of that radiation is reflected downwards. That is probably why there is a great gap between the boulder rock ledge and the ice below it. Sunshine has melted away the nearby ice to open up this yawning chasm. The hours pass by and soon it is midday. Now it can be seen that the sunlight is shining directly into the gap and its walls of ice have become shiny with fresh meltwater. But this day will last no longer than any other; the sun continues its inevitable traverse off to the west. Near the end of the afternoon it disappears into another bank of clouds, much thicker this time. Now the weather changes quickly; it grows windy and cold. Soon a heavy snowfall begins. By early evening a thin bank of snow has drifted up against the western side of Boulder Rock.